Get the year started off right with a super fast and flat course. The paved Glacial Drumlin Trail is perfect for an early year PR and then see if you can crush it at the Last Call in December on the same course. If you signed up for the series, we will have a finisher medal for you at packet pickup. Series age group awards will be done at the wrap party Thrusday April 4th from 6:00 pm - 7:00 pm Enduance House Delafield. Series age groups medals and the Team Challenge trophy will be done at the party. If you can't make the event, we will leave the medals at Enduance House Delafield for a couple weeks and then have them available at our office. Bring the kiddo's out for a Kiddos 1K . It's free if a parent is running. SCSS Wants To Save You Money! At registration checkout, you will be given the option to share to Facebook that you've registered for a super fun event with SCSE! For every 3 people you get to register for the same event using your unique link, you'll get $10 back from your registration. On your emailed registration receipt, there will be a registration link that you can forward to your friends to let them know they should join you on your next adventure! For every 3 friends you get to register for the event using your unique email link, you'll get $10 back on your registration! Run the First Call with the best local running and training community in the area - Endurance House in Delafield. The 5K/10K will start as soon as the half marathoners clear the course. We expect that will occur no later than 9:30. See the race day instructions for details. ​Everyone who is registered by noon Wednesday March 21st will be guaranteed a custom First Call shirt. After that, we cannot guarantee shirts and they will only be available while on line supplies last. The shirts are gendar specific dry wick. The FEMALE shirts run small! During packet pickup at Endurance House Delafield, BUY ONE GET ONE 30% off any shoe/apparel combination! Remember to pick up your raffle ticket for a free pair of shoes to be given away at the race. Parking is availabe in the lot next to EB Shurts or on the surround roads. New for 2019, the start line will be on the Glacial Drumlin Trail and parking will be available on Sentry Drive. Sentry Drive will NOT be closed and please do not park in any of the surrounding business lots. 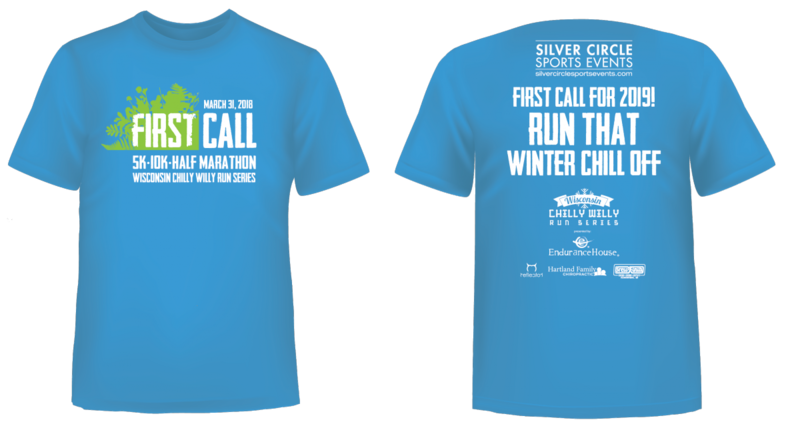 The First Call is part of the Wisconsin Chilly Willy Run Series presented by Endurance House Delafield.